1789–1799: The French Revolution was fought. 1798 (January 19): Auguste Comte was born. 1830–1842: Comte published Cours de Philosophie Positive in five volumes. 1838: Comte attempted to establish the principles of sociology as a unifying scientific philosophy. 1844: Comte fell in love with Clotilde de Vaux. 1846: Clotilde de Vaux died of tuberculosis, prompting Comte to dedicate himself to his new religious ideals. 1851–1854: Comte published four volumes of Système de politique positive, which presented a nuanced formal structure to the Positivist religion. 1857 (September 5): Auguste Comte died, leaving Pierre Laffitte as executor of his church. 1865: John Stuart Mill wrote Auguste Comte and Positivism, which criticized the development of a religion out of the Positivist philosophy. 1867: Mary Ann Evans published a poem under her pen name George Eliot, O May I Join the Choir Invisible!, which illustrated the Positivist concept of humanity as the Grand-Être Suprême, the Supreme Great Being. 1867: Richard Congreve founded the London Positivist Society to bypass the authority of Pierre Laffitte’s executorship. 1867–1868: David Goodman Croly and other Positivists in New York City founded the First Positivist Society of New York, based on the English society set up by Richard Congreve. 1869: The more strictly orthodox Positive Society of North America split from the First Positivist Society of New York. 1878: Richard Congreve founded the Comtist Church of Humanity in London. 1881: Raimundo Teixeira Mendes founded the Brazilian Positivist church, Igreja Positivista do Brasil, in Rio de Janeiro. 1897: The Temple of Humanity opened in Rio de Janeiro. 1905: The chapel in the Temple of Humanity in Paris was inaugurated. 1974: The London Positivist Society disbanded. 2009: A heavy storm collapsed part of the roof of the Temple of Humanity in Rio de Janeiro, and thieves absconded with the original design of the Brazilian flag and other Positivist treasures. In the wake of the social, political, and philosophical reforms of the French Revolution, philosopher Auguste Comte [Image at right] sought to create a religious order to provide moral order and cultural cohesion after what Comte saw as the inevitable collapse of metaphysical religion. Comte’s proposed religious order compelled the promotion of “civil emotion,” a stifling of ego seen as necessary for the development of a strong republic. The religion was based on Comte’s philosophy of Positivism and was later to be called the Religion of Humanity (Nussbaum 2011:8–9). In place of the calm detachment supposed to characterize a scientist there is all the zeal of a preaching monk who has, moreover, gone a bit fanatic about details as well as objectives. Religion, earlier scorned as the stumbling precursor of and obstruction to science, had become for him the great social bond, the ennobler of men and nations, the practical method by which sociology will make a polity for governing the world (Bryson 1936:344). In considering the system of religion, politics, and morals, which in his later writings M. Comte constructed, it is not unimportant to bear in mind the nature of the personal experience and inspiration to which he constantly attributed this phasis of his philosophy. But as we shall have much more to say against, than in favor of, the conclusions to which he was in this manner conducted, it is right to declare that, from the evidence of his writings, we really believe the moral influence of Madame Clotilde de Vaux upon his character to have been of the ennobling as well as softening character which he ascribes to it (Mill 1968:131–32). Comte immediately dedicated himself to building his religion, for which he set out a structure in Catéchisme positive. The developing industrial capitalism of the Western world worried Comte, who saw the trend as affecting, “a growing spiritual anarchy which threatened, “modern societies” with “universal dismemberment” (Wernick 2001:81). If Comte envied the old religions for anything, it was the spiritual and moral order with which they imbued societies. Thus he arranged for his own religious order to provide a strict, involved, morally regulative structure. These ambitious and elaborately ornamented plans never gained enough support or credibility to realize their organizational goals, and the function of clergy became a hotly contested issue among Comte’s later followers and critics. While Comte’s vision of replacing the standard religious institutions did not coalesce in the manner he anticipated, the history of Positivism is one of prominent secular influence. Popular English authors such as John Stuart Mill, Mary Ann Evans (i.e., George Eliot), and Harriet Martineau were heavily influenced by Comte and Positivism, although they did officially not join the Religion of Humanity or partake in the organized religious elements of the philosophy (Bryson 1936:349). At this time, as well, Comte began meeting and conversing with sympathetic academics from Europe and North America who were interested in the organizational elements of the Religion of Humanity. One of the most enthusiastic supporters Comte met in the 1850s was Richard Congreve [Image at right], who founded several Positivist organizations in England. A group of history students at Wadham College, Oxford, which came to be called Mumbo Jumbo, began meeting in the 1850s under literary critic and historian Frederic Harrison. They mused publicly about the contemporary state of religion in Europe, to the chagrin of Harrison, who found some of the frank discussion regarding Christianity and scriptural inerrancy distasteful. Richard Congreve was a tutor ordained in the Anglican tradition at Wadham College, and he became a mentor to this discussion group. Harrison reports that at this time, Congreve had already departed from the Christian faith, and while he had yet to vocally endorse Comte and his beliefs, he had begun frequently communicating with Comte in France, which would continue for five years until Comte’s death in 1857 (Bryson 1936:345–47). In 1854, Congreve resigned from his positions at Wadham College and began his devotion to the study of Positivism and the proposed structures of a Positivist church. He began translating Système de politique positive and Catéchisme positiviste into English, along with other followers from the Mumbo Jumbo group at Wadham. Congreve began studying the physical sciences to further round his education so as to be eligible for the role of a Positivist priest. This position required education in multiple fields, and he eventually achieved the position of doctor of medicine. In 1867, Congreve founded the London Positivist Society , which was answerable to the Positivist Society in Paris. Ten years later, “an open movement of dissatisfaction,” arose around the leadership of Pierre Laffitte, the executor of Comte’s estate, who was elected to a directorship of the French church. In 1878, Congreve split from the French group and founded The Church of Humanity at Oxford. In its organization, none was elevated higher than Congreve, who was not answerable to Laffitte or the Parisian church (Bryson 1936:348–52). The religion spread from Paris to London/Oxford to New York, where it attracted, “key metropolitan opinion-makers […] plus an intriguing collection of lawyers, physicians, academics, journalists, and poets, some of whom would become nationally prominent in years to come” (Harp 1991:508–09). Congreve’s London Positivist Society, and later his Church of Humanity, more so than the Parisian church headed by Laffitte, inspired the creation of the First Positivist Society of New York between 1867 and 1868. By 1872, the group had swollen to around forty regular attendees, and talk of religious reform (understood as an adoption of the religious elements of Positivism) took over the tone and content of their meetings, which were led by President Henry Evans, who began referring to himself as a priest. (Harp 1991:514–18). The New York Positivist group took several names, and the organization of leadership changed significantly, although the original membership did not change drastically. Allegiances wavered over time between Congreve, Laffitte, neither, and both, and the group eventually disbanded in the 1890s (Harp 1991:521–22). It may be that this lack of coordination among Latin and South American Positivists led to the decline of Mexican and Argentinian religious Positivism, or it may be that this lack of coordination insulated Brazil’s Positivists from the collapse of the movements in other Latin and South American states, but for some speculable reason, the few Positivist groups of Brazil are the sole remaining active and observant Religion of Humanity congregations in the New World. The Brazilian Positivists began their communion with the Rio de Janeiro Positivist Society in 1876. In 1891, the first Temple of Humanity was completed in the wealthy Glória neighborhood, now a series of middle-class apartment high-rises (Hennigan 2014). In 1897, the second Temple of Humanity in Rio de Janeiro was inaugurated. Enough momentum developed in this time to found three other Brazilian Positivist societies with their own temples, and Positivism became one of the stronger motivating forces in the nation’s casting-off of empire and the establishment of a republic in November 1899 (Ardao 1963:519). In 1889, Positivist Raimundo Teixeira Mendes designed the modern Brazilian flag using the Positivist motto “Ordem e Progresso.” A decade later, it was adopted as the flag of the new republic after the republican revolution in that nation (Hennigan 2014). In 2009, the roof of the first Brazilian Temple of Humanity collapsed. Google Maps satellite imagery shows the temple, now surrounded by middle-class high-rises, covered by a large tarpaulin [Image at left]. The leader of the church at this time, Danton Voltaire Pereira de Souza, organized a campaign to fund the reconstruction of the roof. When he died in July 2013, his son Alexandre took over the reconstruction efforts (Hennigan 2014). The three central tenets of the Religion of Humanity, as laid out in Comte’s Système de politique positive, are altruism, or that which stems from generosity and selflessness; order, of the political, social, and moral kind; and progress, the guided motion of Humanity toward a greater future. All religious Positivists are expected to embody altruism, order, and progress in all of their words and actions (Simons 2015). Humanity is not composed of all individuals or human groups, past present, and future, indiscriminately brought into an aggregate (agglomerés). No real whole can be brought about, except from elements that are essentially ‘associable.’ The Great Being is formed only by the concurrence, either in time or in space, of lives that are ‘assimilable,’ or, in other words, sufficiently capable of being incorporated. Those who are encumbrances on the race are not members of humanity (Wilson 1927:95). This vision of Humanity, in the Religion of Humanity, was the primary object of worship. Essentially, the transience of the individual renders the meaningfulness of an individual effectively nil unless one does something in their life that is worthy of remembrance upon their death. This contribution to the remembered knowledge of Humanity inducts one into what Mary Ann Evans called, “the choir invisible/ Of those immortal dead who live again/ In minds made better by their presence” (Stedman 2003). 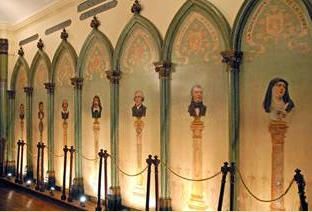 In the Chapelle de l’Humanité in Paris, busts of these men and women are painted along the side walls of the worship hall [Image at left]. The continued focus on progressive moral order reflects Comte’s original motivation to prevent the social moral anarchy that he believed would follow the collapse of organized religion if nothing were to take its place. 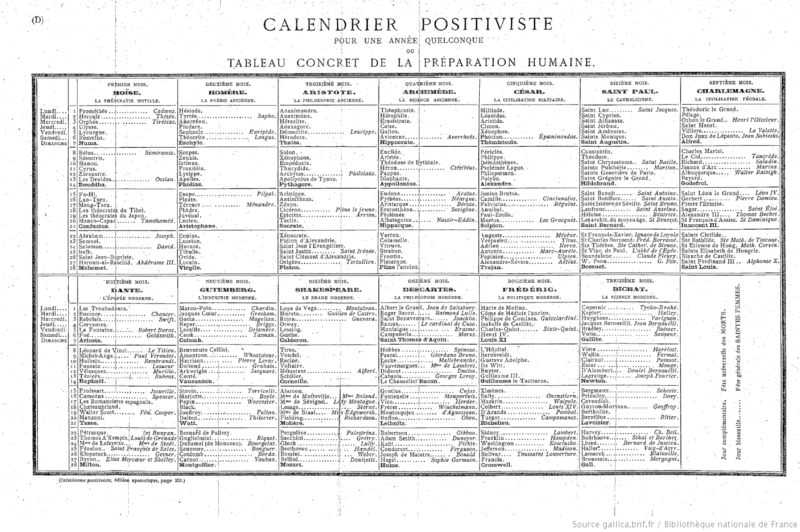 To commemorate the conglomerate of great human beings, Comte set up the Positivist calendar [Image #6 in endnotes]. The calendar sets apart great human thinkers in three ranks: thirteen of the greatest thinkers of Humanity were chosen to represent the months, fifty-two great human thinkers were chosen to represent each week with a Sunday bearing their name, and 312 further contributors to human knowledge were chosen to represent the remaining days of the year. Comte explained this veneration: “the calendar was a provisional institution, destined for the present exceptional century, to serve as an introduction to the abstract worship of Humanity” (Simons 2015). For every day of the calendar, Positivists are reminded of the works of a particular great contributor to Humanity, and they are asked to reflect on what made that person worthy to join the Great Being. This reflection functions as worshipful admiration of the Great Being as well as contemplative instruction on how to join the Great Being. The months, which occupy an elevated position over the other 344 names, are named for Moses, Homer, Aristotle, Archimedes, Julius Caesar, Saint Paul, Charlemagne, Dante, Gutenberg, Shakespeare, Descartes, Frederick the Great, and Bichat; these were chosen as the greatest minds in theology, philosophy, science, and the arts from both the ancient and contemporary worlds. “For each degree of our ideal presentation of the past, the chronological order removes all uncertainty as to the position of any given type; […]” Comte explained, “except in reference to the first degree; there the best servants of the Great Being find their highest honour in giving names to the thirteen months of the Positivist year” (Simmons 2015). At the end of each year, a day is specified that belongs to no month and is named after no person. This high holiday of the Religion of Humanity was reserved for the commemoration of all who have died in the preceding year who have gone on to join Humanity. 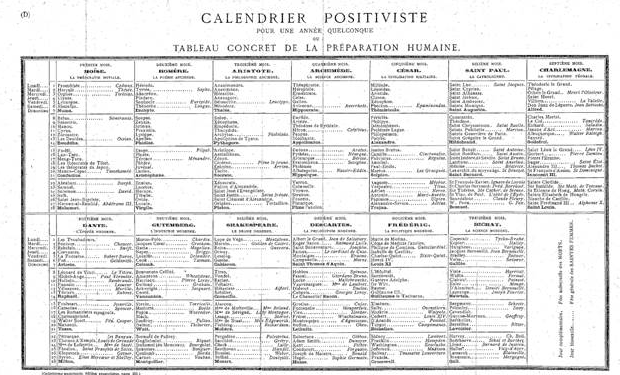 The Positivist calendar also replaced the Christian BC/AD “year one” with 1789 on the Gregorian Calendar, the first year of the French Revolution, what Comte called, “the Great Crisis.” For example, Comte’s own birthday on the Gregorian calendar, “the nineteenth of January, 1798 in the Year of our Lord,” would be rendered on the Positivist Calendar, “the nineteenth of Moses, in the tenth year of the Great Crisis.” Dates before the French Revolution were referred to as having occurred before the Great Crisis, thus the traditional date of the signing of the American Declaration of Independence would be rendered 18 Charlemagne, 13 BGC, instead of July 4, 1776 AD (McCarty). Services in Positivist temples were clearly derived from Catholic and Anglican worship practices, so much so that Thomas Henry Huxley accused Comte of aping Catholicism: “Comte’s philosophy [is just] Catholicism minus Christianity” (Huxley 1893:354), later clarifying that it is, “sheer Popery with M. Comte in the chair of St Peter, and with the names of the saints changed” (Huxley 1870:149). The positivist ritual consists of classical music, readings from Comte’s works, debate and invocations to the Supreme Being. It was conducted weekly until one night in 2009 when the roof, its wooden beams weakened by Brazil’s notorious tropical termites, suddenly caved in (Hennigan 2014). In addition to these weekly meetings, every day of the Positivist calendar names a person whose contributions to Humanity are to be observed. Further festivals throughout the year were to be, “organized around events in the human life cycle—birth, maturity, marriage, parenthood, aging, death—and also around the stages of human history. […] All in all, there are to be eighty-four festivals, thus more than one per week” (Nussbaum 2011:9–10). The preparation of these rituals and festivals was to be delegated to artists, musicians, poets, and authors, for whom Comte gave detailed instructions. In addition to these, Comte dictated that all Positivists were to spend two hours every day in prayer and contemplation of one of the great members of Humanity, dictating, in the style of Islam, even the bodily positions that one must take during prayer. Throughout the service, Christian references to God were replaced by invocations of “divine Humanity.” “By this first sacrament,” the priest was to explain, [“]religion gives a systematic consecration to every birth, and binds anew the fundamental ties that bind us to another, and all to Humanity.” A reading followed from Comte’s Positivist Catechism , then, instead of renouncing the devil, the parents are asked to reject “all the sins of inordinate selfishness.” The “presentation” concluded with “the sign of Love, Order and Progress” being made upon the child’s forehead and a recitation of a positivist version of the Lord’s Prayer (Harp 1991:518). The rites and liturgy of the Religion of Humanity mimicked the same in Catholicism, but each had their own Positivist spin, turning the object of veneration in these rituals toward Humanity, the Great Supreme Being. Looking back over the period of his first synthesis (1826–1842) Comte liked to think of himself as the Aristotle of Positivism. With the religious program, announced in the second, he aspired to be its St Paul—not only as an evangelist for the new faith, but above all as the organizer of its Church. Besides congregations, there were literal churches to be built, surrounded by elaborate cemeteries, and Positivist priests to be recruited, trained and set to work. The religion of Humanity was to have two hundred residential presbyteries in France alone, with one priest per 6,000 inhabitants. Beyond that, beginning with the most advanced societies of Western Europe, then spreading from the ‘white races’ to the ‘less advanced’ regions of Asia and Africa, it was to expand into a global organisation. Coordinated by national and regional councils, under the overall guidance of seven ‘metropolitans’, this would culminate in the primacy of the sacerdoce in Paris (x:323–7). Not merely St Paul; in fact, Comte was to be Positivism’s St Peter as well, inaugurating the office of Grand-prêtre de l’Humanité in his own august person (Wernick 2001:5). What was meant here by temporal authorities is perhaps more aptly phrased governmental authority. Indeed, Edger envisioned a type of theocracy where both government and religion functioned under the uniting yoke of Positivism, and where leaders of industry were given a paternalistic charge over their respective labor forces. The moral authorities of the Religion of Humanity would ensure that the leaders of industry acted ethically and with the interests of their workers in mind. The priesthood was to have been recruited from those with heavy academic backgrounds in the sciences and arts. First, at age twenty-eight, anyone thinking themselves qualified may apply as an “aspirant.” Before thirty-five, they must have completed training to be inducted in the “vicariate,” and at forty-two, the church would pick “priests of Humanity” who sit in succession directly underneath the High Priest of Humanity, initially Auguste Comte himself. Comte wished to expand his clergy in the West, before spreading into Asia and Africa, with the goal of one Positivist temple per ten thousand families (Simons 2015). Modern practitioners of the Religion of Humanity, if the handful of dozen-strong extant congregations worldwide can still call themselves a single religion, do not have the sort of rigid structure envisioned by Positivists in the nineteenth century. In the twentieth century, the vestiges of attempted organization atrophied everywhere, surviving only in Brazil. Even in Brazil, though, congregants are dwindling, and the great temple lays in partial ruin. Rather than a nested system of clergy culminating in a central authority, Brazilian leadership is fractured between independent groups in three deteriorating temples (Hennigan 2014). 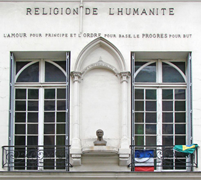 The Chapelle de l’Humanité in Paris [Image at right] is the only remaining Positivist temple in Europe. No longer the host of an active religious congregation, it primarily operates as a public museum. Its defunct website was last updated in 2010. Even after a century of decline, it would be unfair to those remaining Positivists to declare their religion defunct; however, it may be fairly said that the Religion of Humanity, and religious Positivism in general, has reached its figurative December years, or in the reckoning of their own calendar, they are nearing the end of Bichat. Image #1: Portrait of Auguste Comte, photograph by Jean-Pierre Dalbéra. Image #3: Portrait photograph of Richard Congreve. Source: Archives Maison d’Auguste Comte. 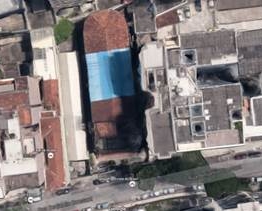 Image #4:Google Maps satellite image of Templo da Humanidade in Rio de Janeiro, Brazil showing collapsed roof section. Image #5: Portraits of the busts of those for whom Positivist months were named. The Positivist Calendar by Auguste Comte. Source: Positivists.org (originally, Bibliothèque nationale de France, 1849). View full-size image at http://positivists.org/i/calendar.png. La chapelle de l’Humanité in Paris, photograph by Jean-Pierre Dalbéra (cropped). Ardao, Arturo. 1963. “Assimilation and Transformation of Positivism in Latin America.” Journal of the History of Ideas 24:515-22. Bryson, Gladys. 1936. “Early English Positivists and the Religion of Humanity.” American Sociological Review 1:343-62. Harp, Gillis J. 1991.”‘The Church of Humanity’: New York’s Worshipping Positivists.” Church History 60:508-23.
http://www.irishtimes.com/news/world/cult-of-comte-s-positivism-claims-key-role-in-brazil-1.2051387 on 30 May 2016. Huxley, Thomas Henry. 1893. Collected Essays, Vol. 1. London: Macmillan. Huxley, Thomas Henry. 1871. Lay Sermons, Addresses, and Reviews. New York: D. Appleton. McCarty, Rick. n.d.”Interactive Positivist Calendar.” Home Page for Calendar Reform. East Carolina University. Accessed from http://myweb.ecu.edu/mccartyr/pos-cal.html on 16 June 2016. Mill, John Stuart. 1968. Auguste Comte and Positivism. Ann Arbor: University of Michigan. Nussbaum, Martha. 2011. “Reinventing the Civil Religion: Comte, Mill, Tagore.” Victorian Studies 54:7-34. Simons, Olaf. 2015. “The Religion of Humanity.” Positivism. Accessed from http://positivists.org/blog/religion-of-positivism on 14 June 2016. Stedman, Edmund Clarence, ed. 1895. A Victorian Anthology, 1837–1895. Cambridge: Riverside Press. Wernick, Andrew. 2001. Auguste Comte and the Religion of Humanity: The Post-Theistic Program of French Social Theory. Cambridge: Cambridge University Press. Wilson, Mabel V. 1927. “Auguste Comte’s Conception of Humanity.” International Journal of Ethics 38:88-102.